A VR experience is also in the works. 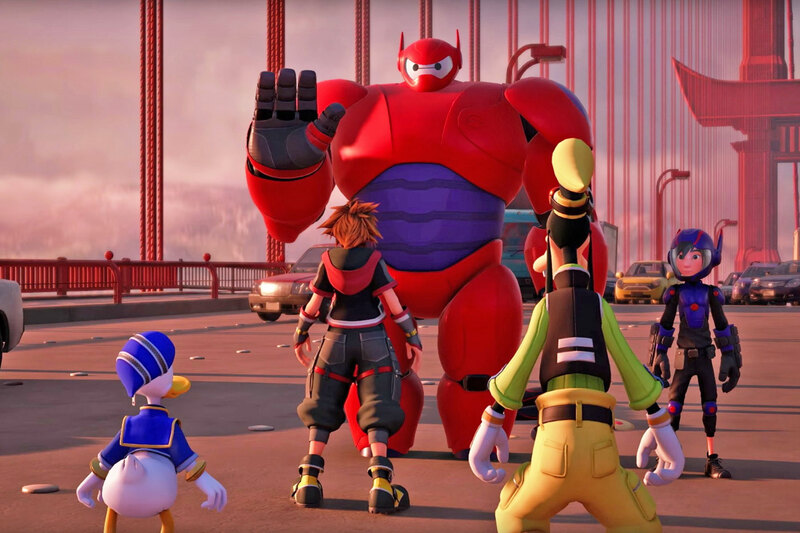 Back in 2015, Square Enix confirmed that Big Hero 6 would be a playable world in Kingdom Hearts 3. Since then, though, we've heard zilch about Hiro, the lovable Baymax and the rest of San Fransokyo's residents. Well, the wait is finally over. During a "Lineup Tour" event ahead of Tokyo Game Show, Sony revealed a new Kingdom Hearts 3 trailer that shows cutscenes and gameplay from the superhero-inspired locale. As expected, Sora, Donald and Goofy team up with Baymax and eventually acquire a transformational Big Hero 6 keyblade called Nano Arms. Combat sequences take place on a bridge, atop a skyscraper, and on the city streets. Big Hero 6 is the main focus, however the new trailer also showed some cinematics from the previously announced Tangled and Monsters, Inc. worlds. One of Xehanort's incarnations also appeared, followed by another shadowy figure wearing an Organization XIII jacket and Vanitas' old helmet. The latter said cryptically: "Only when your hopes have been broken by battle upon battle can the key to Kingdom Hearts be claimed." Finally, the teaser revealed the updated Gummi Ship sequences that tie together each world. They look greatly improved over previous games, with bullet hell-inspired boss battles and destructible asteroids. Today, Square Enix also announced that a Kingdom Hearts experience is being developed for PlayStation VR. It will be available for free this holiday season and, of course, allow you to slay some heartless with a keyblade.